Staples 25 sheets at a time using S.F. 3 Premium Staples. Comes with 2 white/blue, 2 white/yellow, and 2 white/purple staplers. These assorted color SmartTouch Compact Staplers from Swingline power through 25 sheets at a time with up to 50% less effort than standard staplers. Sleek and stylish, these half strip desktop staplers bring ease and simplicity to everyday stapling tasks. With soft-touch accents and an ergonomic design, SmartTouch Compact Staplers are perfect for office use. Each order comes with 2 white/blue, 2 white/yellow, and 2 white/purple staplers for a total of six. Swingline recommends using S.F. 3 Premium Staples for optimal performance. Product number SWI-66506. Welcome to MyBinding video. 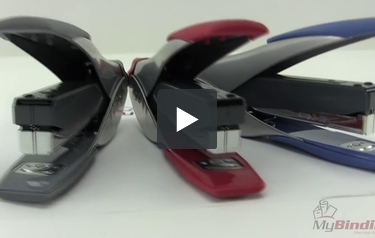 Today we have a little look at Swingline's SmartTouch low force stapler. It looks pretty cool and is pretty comfortable and it works even better. We have a lot more colors that what you see here. This compact stapler delivers premium staple performance. It's super comfortable, ergonomic, does not slip at the hand and is easy to load. Push the button on the back, out pops the carriage, load the staples, you're on your way. Its design makes it 50% less effort every time you staple. This one can handle up to 25 sheets of 20 pound paper in a single shock. It takes standard size SF3 staples and has a pretty good throat depth length for a compact stapler. Punching through this stack felt like 3 sheets. That's it, that's a Swingline SmartTouch low force compact stapler. For more demos, reviews and how to's, check out MyBinding.com.